Above: Great books for holiday gift giving. Few artists can lay claim to successfully reinterpreting a 500-year-old cultural and artistic tradition. But the polychrome wood sculpture that is at the heart of Luis Tapia’s santero practice does just that. In this first comprehensive collection of photographs of Tapia’s work, five writers and scholars examine sympathetically the traditions, practices, and implications of a project that is as much about educating non-Hispanics and non–New Mexicans as it’s about exploring the changing world of Latino/Hispanic/Chicano identity. In the nearly 100 pages of plates (see p. 78) and in pictures scattered throughout the essays, the range of Tapia’s work is evident—from a carreta de la muerta (which includes human hair) to his representation of Barrio Barbie, little black dress and sombrero included. No one does the sort of work that New Mexico blacksmith and sculptor Tom Joyce does—not now or, as his 2003 MacArthur grant demonstrated, ever. A stunning amalgam of the organic and the mineral, this collection of finished works—many located “in situ” in nature—accompanied by closely observed photographs of Joyce at work, is revelatory. Close-ups abound, with their fractures, dendritic castings, and abrupt lacerations transforming what we imagine steel to be. Wilson-Powell’s essay is particularly fine and draws renewed attention to Joyce’s self-taught exuberances and his eye for performance. Both are amply evident in the 200 pictures of his work that sit at the heart of this book. Through December 31, you can see his major exhibit, Tom Joyce: Everything at Hand, at the Center for Contemporary Arts in Santa Fe. By John Nichols (University of New Mexico Press) New Mexico’s favorite iconoclast turns pensive in this ode to his beloved Sangre de Cristo Mountains and the Río Grande, while paying meticulous attention to the turning of each season. At 75, he’s had plenty of time to traipse up peaks, wade through marshes, adopt a sparrow hawk, and build a few campfires. “I could imagine that nobody else on Earth was outdoors, let alone up high, just me and my friend,” he writes. “We absorbed the placid afternoon. No noise disturbed us. No planes flew overhead.” Nichols’ lyrical introductory text hands off the book to his own photographs and brief descriptions that his fiction fans will devour with delight—before heading outdoors themselves. Among the many characters within the Taos Society of Artists in the early decades of the 20th century, perhaps none was quite as controversial or inconsistent as the German Walter Ufer. This catalog, authored by longtime Ufer scholar Dean Porter, brings together a large number of the artist’s paintings and pairs them with a sympathetic but clear-eyed assessment of the life and work of a man who was equal parts troublesome and brilliant. Of particular note is the collection of self-portraits, which, unlike much of his other work, show Ufer playing with and bending the boundaries between the anticipated and the avant-garde. All countries have iconic imagery that lives large in the popular imagination of other countries. French photographer extraordinaire Bernard Plossu has captured the American West with an eye that is at once clearly gifted and yet familiar. 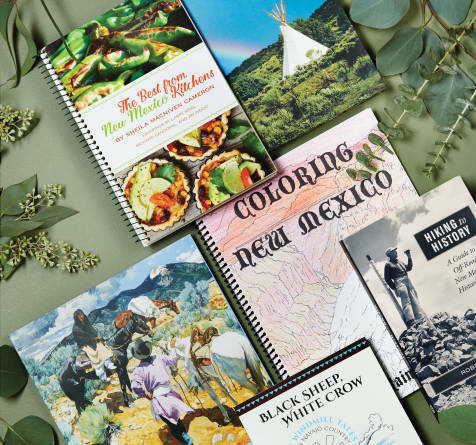 And while there’s nary a cowboy to be found, whether he’s shooting a diner counter in Los Alamos, an horno at Taos Pueblo, the theater in Deming, or the main drag in Seboyeta, this color collection from a man best known for his black-and-white images shines vibrantly true. Pete Seeger’s meditation on war and death—“Where Have All the Flowers Gone”—serves as the lodestone for Dwan’s 144-page, accordion-fold effort to come to grips with the loss that question presumes. Composed of nothing but page after page of slightly grainy black-and-white images of national cemeteries and their rows upon rows of headstones, this work by one of America’s great artistic visionaries (she founded the Dwan Light Sanctuary, near Las Vegas, New Mexico) hits its mark beautifully. Incorporating imagery from cemeteries as well known as Arlington, as large as Calverton, and as little visited as Santa Fe, the pictures of stark white stones on well-manicured lawns, interspersed with towering trees, all blend together—each fallen soldier one into another. The result is both disorienting and disconcerting. Santa Fe’s most storied hotel spills at least some of its secrets in this grand book of short tales and hundreds of images. The kickoff essay by author Stephen Fried lays out today’s case for “Fredhead” fever—aka, love for all things by the once mighty Fred Harvey Company, which changed the face of tourism all across the West. The book explores Harvey’s impact on Native and Hispanic art, Pueblo Revival architecture and interior design, Southwestern cuisine, and, of course, hospitality with a Harvey Girl smile. This book could make you king or queen of the stocking stuffers. Robert Julyan has explored parts of the state even we haven’t heard of and chose 22 of them to illuminate your next road trip. From nailing the precise spot where a broken wagon wheel inspired the creation of the Taos Society of Artists to the tales behind Dog Canyon, William Grudging’s grave, and John Tunstall’s murder, he’ll have you feeling like a member of his Super Adventure Club, which a few of us are lucky enough to belong to. If you’d rather listen than read, Lone Piñon, a trio of northern New Mexico musicians, pulls out the stops reviving the Chicano string-band style you once could hear in every norteño village. Their version of Antonia Apodaca’s classic ranchera “Estas Lindas Flores” alone is worth it. Retro fans take note: You can get CD or vinyl. Detailed drawings of New Mexico’s iconic landscapes will inspire adults to steal their kids’ crayons. Taos-based painter Phillip Cain Kearney would surely endorse that. A love affair with cooking, gardening, and farmers in general inspired frequent New Mexico Magazine contributor Douglas Merriam to compile this lusciously photographed volume. Images of the fruits, veggies, and herbs available at Santa Fe’s expansive farmers’ market, along with the growers and their families, open a door to learning what it takes to coax nutrition from desert soil. Merriam’s recipes, developed by him and his wife, Shannon Plummer, and arranged by season, emphasize the ease of working with innovative ingredients. Even if you live where Hatch green chile is a rare commodity, you’ll find dishes to love. First issued in 1978 by New Mexico Magazine, this tidy cookbook stands as our all-time bestseller. Reissued this year by UNM Press, it should satisfy every New Mexiphile on your list. Featuring recipes that come, mostly, from home kitchens, it hits the posole-guacamole-frijole basics, along with an entire section on cooking with local nuts—pecans, peanuts, and piñons. Native recipes get their due, with Teresa Lonewolf’s Santa Clara Bread Pudding, not to mention Navajo Mutton Stew and Feast Day Posole. Should you be exceedingly inspired, the book even shows you how to build an adobe horno of your own. A Navajo boy loses cell-phone reception while tending his grandmother’s sheep camp and soon falls into the thrall of an old storyteller at a windmill. He teaches the boy about the ring with three stones, the flint bear, and more. Told by Jim Kristofic, who’s logged time in Diné land as a river guide, ranch hand, journalist, park ranger, and oral historian, the tales plunge readers into Navajo lore. A pronunciation guide may even teach you a few handy words. Chapter-book readers will devour it, but don’t overlook the opportunity to read it out loud, preferably while snuggling. Legends of the Blue Nun who reportedly—and magically—bilocated in the 17th century from Spain to the Americas, including into what is now New Mexico, have been used to underscore the importance of Catholicism to Pueblo peoples. Anna M. Nogar and Enrique R. Lamadrid take a different approach in this bilingual book. The Lady in Blue travels to New Mexico and meets Paf Sheuri, a Tanoan Pueblo woman. The women go to a traditional feast, build a friendship, and exchange gifts that change both of their lives—and the lives of their communities. Aided by Amy Córdova’s illustrations, the tale brings the past to life, while inviting readers to practice both Spanish and English. Nogar’s historical essay on the underpinnings of the legend buttresses the book’s imagined encounter. I dreamed I was a dog.” The sleeper’s dreams morph from a dog to a dinosaur, a train, a cloud, a whale, and more. Nakamura’s lavish illustrations invite adult readers to engage in some pint-size Q&A and find out what their own little ones might dream of being. Santa Fe’s favorite storyteller (catch him regularly at the Wheelwright Museum), Joe Hayes returns with another rollicking tale of country life, well illustrated by Antonio Castro L. Set in the Depression, it features a magical hambone that gets passed from neighbor to neighbor, who dip it into pots of beans for a hint of nostalgically remembered meat. It even helps save Grandpa’s false teeth after they fall into the well, but we won’t reveal how that happens. You have to read the book.